December 2nd – 10th marks Hannukah and the Festival of Lights this year! To my Jewish readers who have followed this blog over the years, here’s wishing your family and you a most wonderful and spiritual time during Hannukah. What better way to celebrate the holiday with the yumminess of traditional latkes? Although most potato recipes are winners in my (cook)book, these are literally the Best EVER Potato Latkes with Italian Herb Yogurt Sauce that I created. If you’re a carb-watcher, you just don’t know what you’re missing with these little potato pancakes! “Latke” is the Yiddish word for “pancake” and is pronounced LOT-kah. These delicious potato pancakes are traditionally enjoyed for Hannukah because they’re fried in oil that symbolizes the miracle involving the oil of the Temple menorah that lasted for eight days instead of only one. For nearly 1000 years, Jews eat oily foods during Hannukah to reflect and celebrate the significance of this event. If you don’t want to use potatoes to avoid the carbs, you can also use carrots, zucchini, cheese, or whatever you enjoy frying. Doughnuts, even filled with jelly are acceptable fried foods. Latkes are traditionally served with sour cream and/or applesauce. So for my version of this dish, I was inspired to create a recipe with more healthy Greek yogurt with an Italian twist on the traditional sour cream sauce used for latkes. First of all let me just say this: This recipe for Latkes is SUPER EASY PEASY and YUMMY! I amped up my own version of latkes with an ample dose of garlic and rosemary, a traditional Italian herb combination among all of my family’s potato recipes! Utterly and seriously irresistable! And if you’ve ever been to Italy, you now know from this source, that these are literally the two herbs that take Italian potatoes over the top! These are seriously the Best Potato Latkes with Italian Herb Yogurt Sauce that will ever cross your lips! You’ll NEVER know that ‘less-healthy’ sour cream is replaced by ‘more healthy’ Greek yogurt. – – I love this recipe and I know that you will too! yogurt sauce amped up with lots of garlic, rosemary and chives! Mix the shredded potatoes, onions, garlic, salt and eggs in a medium mixing bowl. Shape the potato mixture into small pancakes about 3 – 4 inches wide by about 1″ deep. Carefully place the latkes in the hot oil and fry until golden brown on both sides. Mix the garlic and rosemary in the yogurt or sour cream. Disclosure: Absolutely no compensation or free products were earned for this blog post. In fact, I purchased yogurt with my own personal funds to create this recipe. I do not endorse Chobani yogurt as being any better than other brand of Greek yogurt. This brand was on sale and that’s what I purchased. Oh Judee, I am so grateful for your approval of this recipe that I created for my friends at Chanukah. If you do prepare them, I would love to know what you think. Happy Chanukah! This looks delicious – I’ll have to try it! Thanks Suzy, I ate them straight off the platter once my photos were shot…..I’ve got the rest of the batch to enjoy with dinner tonight! Grazie Catherine, You’re so kind and I appreciate your words and your visit! I could also lay aside concerns for carbs with these potato latkes! Thanks Maureen, we’re crazy about potato recipes! They sound delicious Roz and I like the presentation. Thanks so much! Although I’m not Jewish, I knew that the colors commonly used are blue and gold, so I just went with it, since I rarely use those dishes (they’re antiques and I’m scared to use them!). Merry Christmas to Bev and you! These latkes look so beautifully golden brown and crisp! Thanks Angie, we just love potatoes shredded and cooked. Thanks for your kind visit! I absolutely love potato latkes/pancakes but am usually too lazy to go to the trouble. Gotta kick myself into action! They look delicious and so crispy. Hi Susan, Once the batch was made, it was a breeze to fry and serve them up quickly. 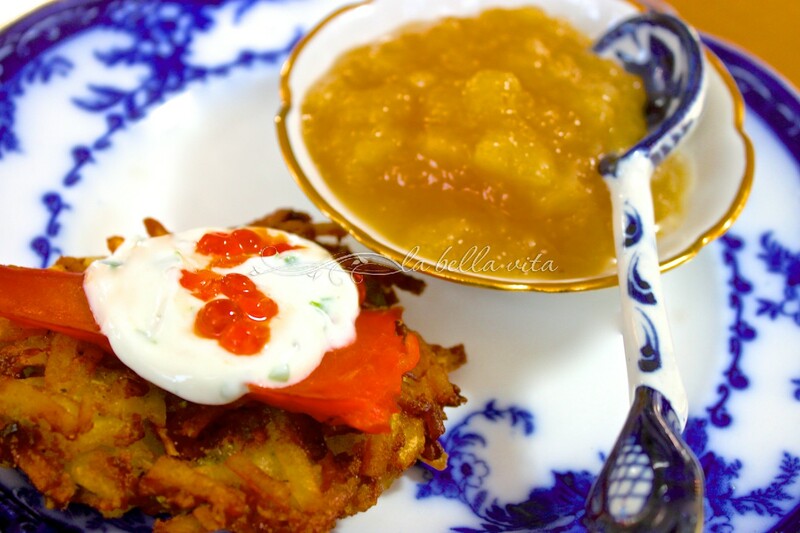 Bella Roz- we love these potato Latkes from time to time and yours look and sound delicious! Love the Italian yogurt sauce. Have a wonderful week! Thanks Liz and Anna! I can’t get enough fried potatoes in my life, not the healthiest recipe, but so darn good! I really like that you added rosemary to the potato latkes. Yours look so nice and crispy….they would have been wanting a second helping. Hi Karen, thanks so much for your visit and kind comment! Rosemary is a must to add to potatoes in this family . . . and garlic! Ooh those look good! Until I started studying up on the region where I was born I didn’t realize yogurt and horseradish were popular. And your combination looks scrumptious. Thank you for the recipe I’m anxious to make it along with the potatoes. Wow Marisa! I learn something new everyday from my blogging friends! Let me know what you think if you make these latkes! These are so tempting, Roz! I haven’t made latkes in a long time, but love them…and I love the wonderful yogurt sauce you’ve made to accompany them. Hi Liz, This was my first time to make latkes and really enjoyed them. I can’t remember the last time when I enjoyed a really good latke….I do love latkes. You did a really nice job. 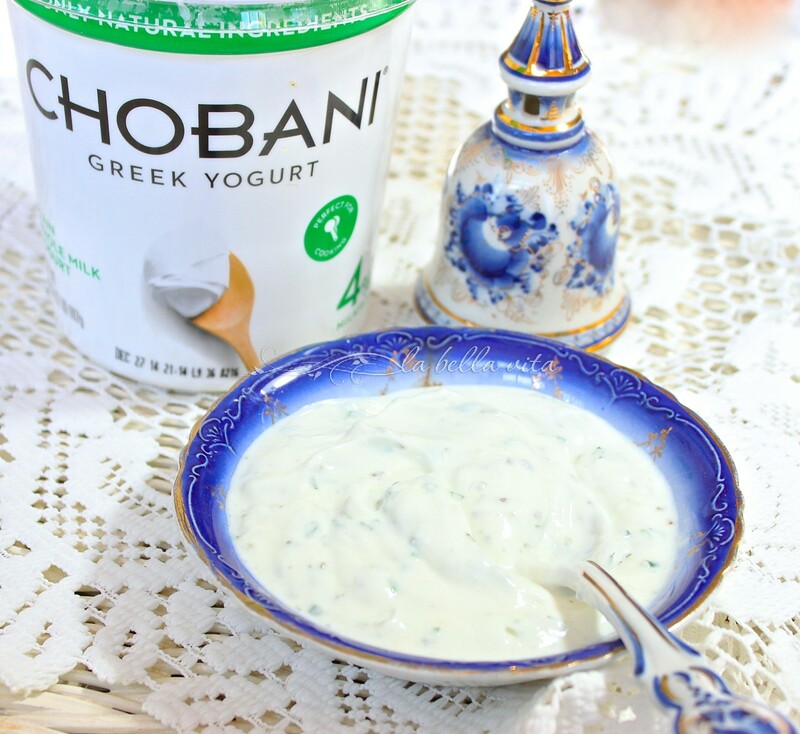 I like the yogurt with the Italian herbs, that was a nice twist. Looking forward to your new recipes and hanging with you in the blogosphere in 2015. You are so sweet Velva! Do you realize that we have been blogging friends since just about the very beginning of our blogs back in 2008! I can count my true friends on 2 hands . . . 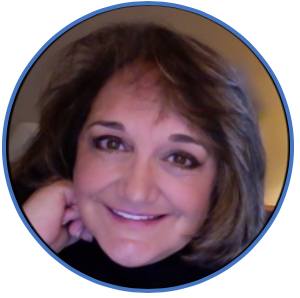 I appreciate you and everything that you post on your wonderful blog! Hi Roz, I love love love potatoes so I know I would love these latkes. I’ve never eaven eaten a latke before. That needs to be remedied! The sauce sounds spectacular to go with it. Thanks so much for sharing your recipe! This was my first time making latkes too, Shari. I was pretty pleased with how these turned out and would certainly make them again. what a delicious recipe Roz,have a relaxing weekend my dear, un abbraccio ! Thank you so much Chiara! I always enjoy reading your comments! Have a beautiful weekend! Roz, this is a really nice twist on traditional latkes. the garlic and rosemary is a winning combination with potatoes and I think the yogurt is a nice modern twist. Thanks so much Velva! The combination was really tasty and I’d definitely make them and the yogurt sauce again! Merry Christmas to you too! I have never tried Latkes but I love potatoes so I think these are on my list to make! Thanks for the recipe. Happy holidays, however you celebrate! Hi Marcellina, These are so easy to make and if you love potatoes, you’ll certainly enjoy latkes at any time of year! I can see why you call them “best ever”. They look absolutely wonderful. The yogurt sauce looks like a great complement as well. I can think of a couple of other uses for that yogurt sauce. Yum! Hope you and your family have a wonderful Holiday Season!!! See you next year my dear! I love potato pancakes anyway, even if I’m not Jewish. Just like hash browns, only in patties! I think the herb yogurt sauce really made this recipe sing! Happy 2017 Liz and Anna! TI love your latkes, I can only imagine how they taste. There’s nothing better than crispy potatoes, but then you add the yogurt sauce and it sounds even better! Great recipe Roz! Now you have me really looking forward to a latke party this weekend. One of these days I’ll make my own and your recipe looks easy and quite delicious. Thanks! The years quickly pass by. No matter your faith, latkes are always a tradition at this time of the year that never goes out of style. Delicious.